Climatrol Inc. designs and installs high-quality ductwork and ventilation systems for our heating and air conditioning customers in Clarksburg, as well as Bridgeport and the surrounding areas of West Virginia. 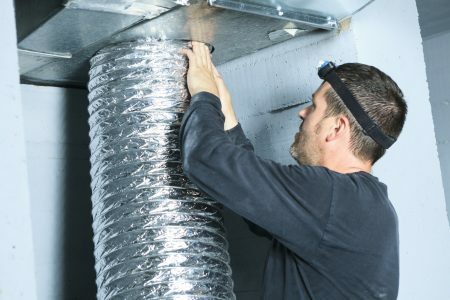 We serve residential, commercial, and industrial property owners by providing comprehensive duct and vent service, including modifications, repairs, maintenance, and cleaning. It is important to remember that your ductwork is a crucial component of your climate control system’s efficiency. Dirty, clogged, or leaking ductwork can lead to increased energy expenditures, as well as exposure to contaminants such as pollen, mold, viruses, and bacteria. If your home or office smells musty or has developed odors that you haven’t been able to locate, it is likely that the cause may be lurking within your ductwork. Aside from changing your filters regularly, the interior surfaces of your ducts must be brushed and cleaned at least annually to remove the accumulated debris that traps the type of contaminants that slow air flow and can make you and your family very ill. Climatrol provides thorough cleaning of your entire ductwork system to help keep your air smelling fresh. Your heating and cooling system must deliver clean, healthy, well conditioned air to prevent harm. We work hard to ensure that our customers’ systems are well maintained to prolong the life of their units, reduce bacteria and viral dispersion, and eliminate obstructions to air flow that significantly impact energy-efficiency. When Do My Air Ducts Need Cleaned? Your air ducts should be cleaned on an annual basis, or more frequently if you have pets that shed fur or if you live in an excessively dusty area (such as near a roadway, railroad, or factory.) If you haven’t had your ducts cleaned for more than two years, contact Climatrol right away. Molds and contaminants build up quickly. If you have noticed that particles or debris blow out of your vents, they produce little (or no) airflow, or you smell a burning smell while your heater is running, your situation is critical and requires prompt attention. Regardless of your maintenance schedule, your filters should be changed at least twice per year. Climatrol offers comprehensive maintenance for all forced air systems. Contact us to schedule a ductwork or ventilation system cleaning, maintenance, or repair service. Free quotes are available. Clean ductwork is always worth the cost. An efficient system pays for itself in terms of both energy savings and less sickness due to elimination of viruses and other contaminants that ducts tend to harbor over time. Call: (304) 623-0606.